Polish FM Czaputowicz thanks Sec. of State Pompeo for organizing conference, insisting Israeli FM apologize for remarks. Polish Minister of Foreign Affairs Jacek Czaputowicz on Thursday spoke on the phone to US Secretary of State Mike Pompeo, the Polish ministry's site said. Pompeo thanked Czaputowicz for helping to organize the Warsaw Ministerial to Promote a Future of Peace and Security in the Middle East. The two also discussed implementation of the Warsaw Process and cooperation between Polish and American research institutes as part of the process, as well as strengthening the US presence in Poland. On the last point, Pompeo confirmed that the US would offer Poland specific proposals in the near future. 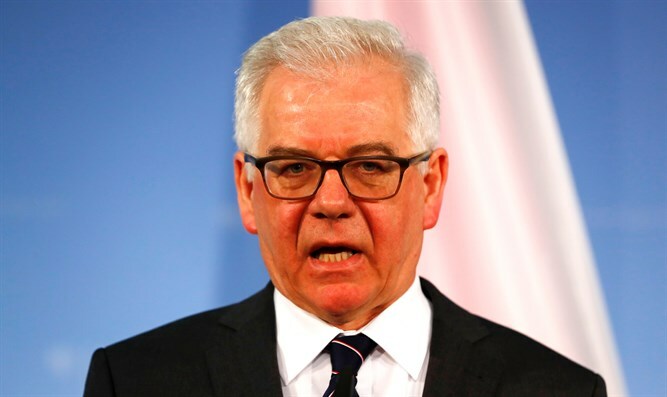 Czaputowicz discussed the support Poland has received recently and thanked Pompeo for US Ambassador to Poland Georgette Mosbacher's insistence that Israel apologize for Israeli Foreign Minister Yisrael Katz's (Likud) statement that "the Poles collaborated with the Nazis." The conference, held last week, focused on bringing countries together to re-examine the conflicts in the Middle East and find new ways to solve them.